BROOKLYN, April 15, 2019 — Brooklyn Bridge Park Conservancy (Conservancy) and Brooklyn Bridge Park (BBP) announce the full lineup of events and activities for the 2019 spring and summer season. This season marks the 20th Anniversary of the Conservancy’s free, public programming in Brooklyn Bridge Park. 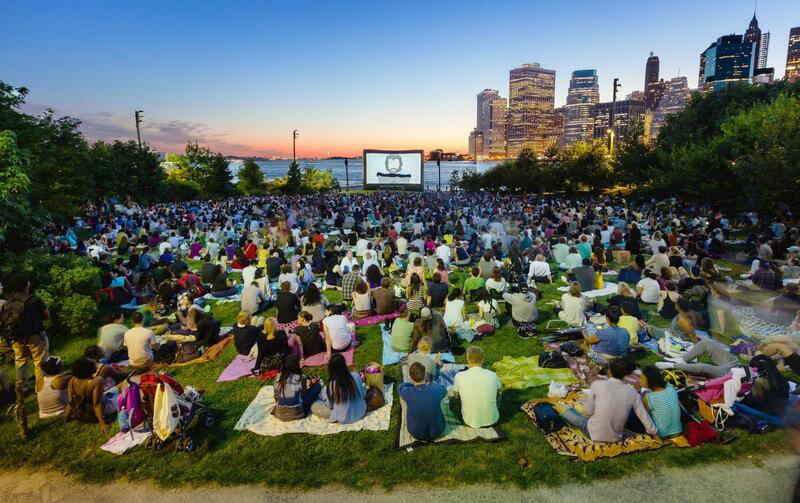 In the summer of 2000, the Conservancy launched its now signature Movies with a View series with the goal of raising public awareness of what it believed would be a vibrant public space on the water. 20 years later, as the park nears completion, Brooklyn Bridge Park and the Conservancy have become key players in the cultural, recreational, and educational life of New York City. Since 2000, more than 1,700,000 visitors have enjoyed the Conservancy’s free, public programs in Brooklyn Bridge Park. Each season, the Conservancy offers over 500 free and low-cost events. In 2018, Brooklyn Bridge Park saw more than 5 million visitors between Memorial Day and Labor Day. During this anniversary season, the Conservancy will offer a full line-up of cultural, recreational, fitness, and educational events that will keep visitors entertained all season long. In celebration of the Conservancy’s 20th summer of programming, Movies with a View, the 8-week film series with sweeping views of the city skyline, returns to Pier 1 on Thursday evenings, July 11th to August 29th. The theme for 2019 is “Better the Second Time Around” and will feature popular films shown over the series’ history. BBP welcomes new and returning concessionaires for the upcoming summer season. Ample Hills at Pier 5, Fornino at Pier 6, Lizzmonade, Luke’s Lobster, and Pilot all return. Two new concessions will be coming to Fulton Ferry Landing. An outdoor café from the Pincus Brothers, and Ample Hill’s newest outpost will open at the Historic Fireboat Station. In Empire Stores, in addition to its restaurants and shops, is the DUMBO outpost of the Brooklyn Historical Society. Their current exhibit, Waterfront, illustrates Brooklyn’s storied past along the coastline. Brooklyn’s vibrant history of workers, families, communities, and industries are brought to life in this multimedia display designed for all ages. Visit DUMBO’s only history museum to take a step back in time and discover the rich history of the Brooklyn waterfront. Notable and new programming are highlighted below. The four-month season of programming stretching from May to August begins with Lift Off: A Waterfront Kite Festival on Saturday, May 11, 2019. Visitors of all ages can watch their kites soar above the Manhattan skyline from its new home on Pier 5. In addition to kite flying, the family-friendly event will feature live music and a number of partners whose activities emphasize S.T.E.A.M (science, technology, engineering, arts, and mathematics) concepts — using wind tunnels, robotic air propellers, and experiments to explore the science of flight. At All the Park’s a Stage, New York Classical Theatre will also celebrate its 20th Anniversary and will treat Brooklyn Bridge Park visitors with a free public theater performance of Oscar Wilde’s The Importance of Being Earnest in June. On Pier 3 Plaza, Dancewave’s new Moving Together program will host dance classes for children and adults of all ages in a communal setting. Dancewave’s expert teaching artists will lead movers of all ages and abilities, exploring Latin, Hip Hop, and Afro-Caribbean Dance. After a successful inaugural launch in 2018, the Conservancy’s live music series, Unplugged, will return to the Pier 3 Greenway Terrace with two partners and an expanded lineup featuring the best of new Americana coming out of Brooklyn. The Brooklyn Americana Music Series and Degraw Sound will curate intimate acoustic sets performed throughout June and July. The Public Art Fund’s installation, Bridge Over Tree will be viewable through September 19 on Empire Fulton Ferry lawn. Bridge Over Tree, by Iranian artist Siah Armajani, is a 91-foot-long walkway with a set of stairs that rise and fall over a single evergreen tree. The FENCE returns to BBP in June for its eighth consecutive year. United Photo Industries, and partner organizations will display the work of talented photographers from around the world in sections throughout the Park. Other cultural programming this summer includes the ever-popular Hindu Lamp Ceremony, contemporary dance performances by Gibney Dance, opera music by the MET Opera, stargazing with Amateur Astronomer’s Journey to the Stars, and book readings at Books Beneath the Bridge, the six-week literary program curated by independent bookstores based in Brooklyn. The Conservancy is proud to announce the launch of brand-new Fishing Clinics for kids and adults this summer. The 7-part series will take place at Pier 5’s fishing station from May-September. The clinics, produced in part by the New York Department of Environmental Conservation, are catch-and-release. Equipment will be provided on-site. Also new in 2019, The Class by Taryn Toomey will come to Pier 2 Turf on select Wednesdays, June through August. The Class is a music-driven, mat-based practice of self-study through physical conditioning. The popular Walk-Up Kayaking program, enjoyed by over 6,500 people in 2018, will continue for three days a week this summer. Families can glide along the East River every Thursday, Saturday, and Sunday with the Brooklyn Bridge Park Boathouse. Dodge YMCA instructors will present several free outdoor fitness classes all summer long, including Sunset Yoga, Sala classes, Zumba, and Hip Hop Dance Aerobics, and Pilates; while Basketball Clinics will round out the Conservancy’s recreational offerings this summer. The Conservancy’s Environmental Education Center will continue to offer Open Hours four days a week, where visitors can learn about the history of the Brooklyn waterfront, the plants and animals of the East River estuary, and the ecology and design of Brooklyn Bridge Park. The Center offers rotating exhibits, arts activities, and a 250-gallon East River aquarium, which houses marine life from the park’s waterfront. In addition to Open Hours, the Center, serving over 20,000 students and visitors each year, will act as the home base for other environmental education programs including Seining, and a variety of School Programs focusing on sustainable design, ecology, geology, and the history of the Brooklyn Bridge. Throughout the season, the volunteer Green Team will offer nature enthusiasts an opportunity to learn about gardening and enjoy the outdoors every Saturday, while regular Coastal Cleanups will allow visitors to help keep the park’s shorelines clean and beautiful. Towards the end of the summer, applications will open for the fourth year of Teens Interested in and Dedicated to Environmental Sciences (TIDES), and will expand to eight sessions. An increasingly popular volunteer program, TIDES is designed for teenagers to complete community service hours, while learning about conservation. Movies with a View is supported, in part, by Twizzler’s, Netflix, StreetEasy, and the New York City Department of Cultural Affairs. Contact: Sin Gogolak, sin@gogopr.nyc, 917-626-0525.